I do not have time to buy books so does anyone know of any links of accurate resources I could use for this lesson aside from the sermons on copticheritage by Albier. Thanks! can someone PLEASE explain how Pope Abba Cyril IV reformed the order of the liturgy?? I heard that he moved the offertory from its original place to the beginning as is done now. Can someone explain this and anything else he may have done? Well I know he asked Cantor Takla (I think that's his name), to add Greek hymns into the Church. So Cantor Takla took some of the hymns sung by the Greek Orthodox Church and modified their tune to a more Coptic style. Some of these hymns are Ton Sina, Tou Litho, etc. yeah i know about those. and also the change in the pronunciation of coptic, the resurrection re-enactment etc. anymore changes that aren't as well known but could be important? Pope Cyril IV did not move the offertory. That change has been done centuries before, and is not traceable to anyone in particular. Feel free to ask questions. I will do my best to answer, if I know. There is no one good resource on this subject written yet. Some books have been written here and there, nothing is that comprehensive/thorough and everything has its issues and weaknesses. The article by the scholar Hany Takla is a great one, although it is not about the history of the liturgy itself, but about the history of the scholarly work done in this field broken down by eras. A great nonetheless, and gives a good background on the field of Coptic liturgy. I have not read the book by Fr. Athanasius Iskander but I trust it will be more or less accurate and useful. The document from the Southern Diocese....Not worth anyone's time. It is full of mistakes and ridiculous generalizations. Avoid and do not take as fact. Pope Cyril IV did not ask Fr Takla to add Greek hymns to the liturgy in an attempt to unite us with the Greek Orthodox Church of Alexandria. This is an unsubstantiated claim that has been perpetuated by the late Ragheb Moftah. The only evidence (weak at best) about Greek hymns is that they appeared in publications a generation after Pope Cyril IV. There is no evidence of any attempt to unite the two churches. The only evidence we have of a union attempt occurs a generation later by a Protestant missionary who got dates and sultan names wrong. Stronger evidence exists for an attempted union between Pope Cyril IV and the Russian Orthodox Church (and it never came about). Just about everything written about Pope Cyril IV has no evidence. I can never argue your knowledge and research loving personality, but if you'll devalue everything related to the era of pope Cyril IV, then there's no point of discussion to be had on this forum. What lfahmy said bears much weight historically and truthfully even if it is not written in books for people in western countries to read, or to agree to. Dr. Moftah actually said that Pope Cyril IV asked Cantor Takla to do this because union with the Greek Orthodox Church was not anticipated. The Pope did not believe we would unite anytime soon, but he still desired the incorporation of some of the Greek hymns. So, he did as we said above. That is what Dr. Moftah says. Whether or not you take it as credible information is your decision. I assume you're affiliated somehow with the great Fr. Shenouda Maher Ishak. (That man is a gift from God to academia and the pursuit of knowledge, spirituality, and historical authenticity). If you're not, then....whatever. The greek hymns we use are almost universally chanted in the Eastern Orthodox and Eastern Catholic Churches, so they may have come to us by way of the Russian Orthodox Church. Someone should look into that. Furthermore, @RamezM , what was the order of the liturgy prior to all these changes, and why was it changed? I was more interested in the historical evolution of the liturgy (not just necessarily Coptic). Are you supporting what @remenkimi is saying, or refuting it? Your tone says the latter, but your words say the former. Anyway, last year I was in the process of translating Erian Guirguis Moftah's "Eladela Elrabeteya" when I was blighted by several mishaps that stopped me from continuing. I'll take this up hopefully some time in the next couple of months. Erian mentions in his book that his efforts are for the purpose of union between the Coptic and Greek churches. Ragheb Moftah belongs to the same family you know, and so what he says is taken as true in itself..
Well I only heard what Ragheb Moftah said and chose to believe it. I guess I am refuting what @Remnkemi said, but I don't have any addtional information to back up my point. That's why I'm not being too assertive. Thanks @lfahmy, please don't get mad at me. 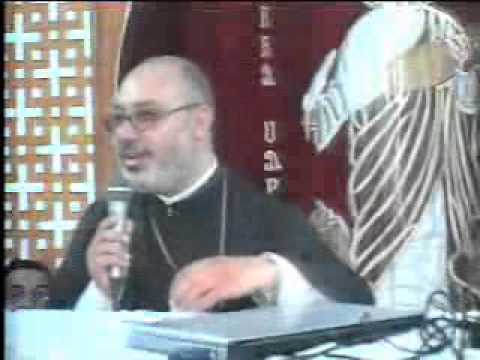 I do sound quite aggressive on the internet while in reality.. oh no, this is a respectable forum.. hehe.. hope I haven't offended you or anybody else..
Introduction to the Coptic Church by Fr. Tadros Malaty has some stuff. It is very basic, but not useless. If you're interested in Historical Liturgics, start out with Anton Baumstark's Comparative Liturgy or On the Historical Development of the Liturgy Then work your way to any works by Paul Bradshaw and Robert Taft. Keep in mind, almost all works by these authors deal with Eastern Orthodox liturgy. There is not really much on Coptic liturgical studies. If you read Arabic, you can read Ibn Kabar's Lamp of Darkness or Ibn Sabaa's Precious Pearl. But these only give you a snapshot of 14th century liturgical practice, not historical development. Modern works by Fr Athanasius may help. Ramez will have better information on this. I am not devaluing everything about Pope Cyril IV, I am devaluing the intellectual dishonesty in attributing events without historical data. It is a known fact in the field of oral transmission that oral history is valid. But even oral transmission follows certain guidelines and certain theories. One cannot simply make a claim about a person from a generation past and we all take it as valid oral history. If I said to you, "My father and grandfather told me that my ancestor discovered the gravity 200 years before Sir Isaac Newton", would you simply believe this oral tradition without any logical or corroborating evidence? I wouldn't. Why are we so quick to believe Ragheb Moftah's and other historians' claims to a proposed unity and a unilateral borrowing of hymns? Don't you think any union would show its fruit in a union of theology before a union of hymns? It is simply illogical. Also, I would love for you to finish Eladela. Please keep us informed when you finish your project. Do you have a source by Ragheb Moftah concerning this claim. His two articles in "Al Keraza" did not say this. It said the hymns Ton synanarkon and eparthenos (and these are the only two he mentioned) came from the efforts of a union. I'll dig up the reference and exact words. If Ragheb Moftah claimed a union was not foreseeable and hymns were added anyways, I'd like to explore his exact language. Whether or not someone chooses to believe Ragheb Moftah, or any other person, is of course a personal decision. My point is that without evidence, personal opinions erroneously become universal fact. When enough people believe a false fact, it is no longer personal opinion, but general dishonesty. If everyone here personally believed the holocaust didn't happen, it doesn't mean we are allowed to take it as historical fact. When it comes to Coptic history (and many times theology and catechesis), all logic goes out the window and we take opinions as fact. But for nearly every other social and liberal science we hold to a higher standard. Why? I can see your point. I just don't agree with your position as you were the one who said in another thread that we're becoming politicians-like. I'm not saying there's no point in research, but there's enough evidence that research can take you only so far as far as the coptic church is concerned. That's because of the decline that occurred for various reasons through the ages.. I did some searching, and I have absolutely no idea why I wrote that. Forgive me. I wrote completely the opposite of what I found in many sources, and what you yourself had found. Yes, this was an attempt at unity from Pope Cyril IV. Also, in addition to the hymns of Ton Sina Narkhon Logon and E Parthenos, Tou Litho was another of the Greek hymns added to the Coptic Church. No scolding necessary. The thing is we do have sources for this time period. They just happen to say the opposite of Rageb Moftah has claimed. One of these days, I'll prepare an article with all I found on Pope Cyril IV. Please share these sources. I look forward to reading that article. @amoussa01 I may be a little late to the party, but in case you're still in need of some resources, I've listed a few below. Keep in mind this collection was gathered by Protestants though. It's also a little dated in terms of scholarship, being from the late 1800s & early 1900s. This resource is dated in it's scholarship, being from the 1897; however it is pretty systematic in documenting liturgical & ritual practices from the literature of the Fathers and teachers prior to the Council of Nicea. It makes an effort to explore possible connections to the Jewish Temple & Synagogue liturgy as well. I am still going to watch. As Remnkemi mentioned these authors deal primarily with the Byzantine and Latin Liturgical Recensions but lots of what they write on can be applied to Coptic Orthodox Liturgical Practice. Liturgy is Liturgy (at least among Roman Catholic and Orthodox Churches), what we learn from one recension often reveals much about another and hopefully all Traditions in essence teach "the world is transfigured" or that "the Church is the World as it should be" or "that we become what we partake of." Since he has more of a historical approach, Fr Robert Taft tends to also compare the manuscript recenions that exist in Syrian, Coptic, Ethiopian and Church of the East. I just wanted to mention that the article posted by BishoyK from Hany Takla "Coptic Liturgy - Past, Present, & Future" is a great jumping off point for more in-depth research. He does a pretty good job summarizing the literature available from the 14th century to the modern times within the Coptic Orthodox Church including published manuscripts and critical editions that can be used for comparison. Some of the resources he mentioned, I posted previously (The Lamp the Lights the Darkness), and after a quick search I've already found this... if I find more of the sources listed, I'll try to add them to this thread. I think the sources shared by everyone so far are great overall, but I would keep things a bit more focused. If the question is about the historical development of the liturgy, not necessarily Coptic, then sources like Takla's article, or Ibn Kabar, are not going to help. Neither will books by Fr. Schmemann, which are more theological/spiritual rather than historical. It is always better to start with the primary texts, since they provide an unadulterated view of the state of the early Church. Of course, these books will offer valuable bibliographies on the these texts, each of which has been studied for decades since their discovery. Gregory Dix's Shape of the Liturgy is a classic in the field. Use with caution, since it is also outdated in some respects, but I suppose for a beginner trying to learn basics it can't harm. Same goes with Baumstark's Comparative Liturgy, although it can be very dry. Robtert Taft is a Byzantine specialist, so he would not be dealing with the early Church per se, but with a specific rite. As you get into the era of Post-Constantine, it is very important to distinguish between different rites and locations. What is true of Antioch, may not be true of Jerusalem, Alexandria, or elsewhere. This is all very general stuff, which is why I have not answered this question for some time. Ask specific questions or topics, and I can share more sources. Almost everything is available digitally now, but hopefully you can read a few languages. Thank you so much for these RamezM.